Not that anyone needs me to point it out. I’m sure you folks have been seeing how things are in Europe and the open door to their own ruination. Anyway ... welcome to the age of stupid, and just another example or two of why Europe and the UK are doomed. Can anyone doubt that it would take an armed revolution and blood freely flowing in the streets to end this self inflicted open wound. That isn’t going to happen. If it does, it won’t be in my lifetime. I imagine there will eventually be small bands of unorganized patriots fumbling around and not really getting anywhere. Govts. today aren’t as innocent (if ever they were) or as helpless against armed revolt as they may once have been. There won’t be another Churchill with a ‘W’ or a “Duke of Marlborough”, (another Churchill with a ‘J’), or a Wellington to save the day. The rot didn’t start yesterday, it started years ago and what we’re seeing so far isn’t the end. There’s worse to come. In an explanation to his family, hospital workers were said to have claimed ‘they didn’t want to upset people’ because they ‘have lots of different cultures coming in’. Sergeant Prendeville’s father, Jim, said: ‘Mark was moved because of his uniform – he was told that twice. The words they used were: “We’ve lots of cultures coming in”. 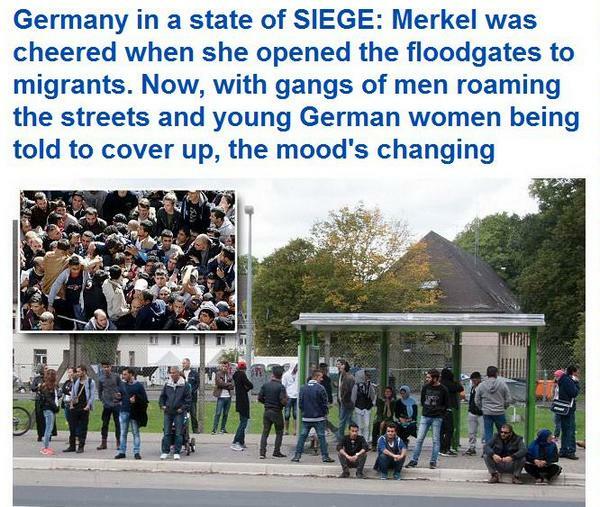 Meanwhile in the former fatherland .... just in case bmews readers had not heard, the arch traitor Frau Merkel has raised the number of invited invaders from 800 thousand to a cool one million. Does anyone actually believe that will the the final figure? I won’t believe the mood has changed enough to matter, unless I saw jack booted men in black uniforms with SS runes on their collar, patrolling the streets of every German city and expelling by deadly force if necessary and even if not, all muslim migrants. Add to that, firing squads to remove the ppl in office and all “rights” activists and enablers who for years, have brought their country to this pass. Don’t look for that to happen any time soon. In fact ... it never will. But anything less will not change things ever. A German woman is set to be evicted from the home where she raised her children on order for the local council to turn her block of flats into a refugee shelter. Bettina Halbey received a letter earlier this month, telling her that she has to move out of her home-of-16-years in Nieheim, west Germany. The 51-year-old nurse has been told that she has until May next year to vacate her flat, as Germany struggles to find housing for the thousands of refugees and migrants arriving in the country every week. The council has justified the eviction by saying that it is a ‘free’ solution to the influx of refugees in the town. ‘A new residential unit for 30 refugees in Nieheim would cost €30,000 (£22,000). This solution will cost me nothing,’ Rainer Vidal, the mayor of Nieheim, told Die Welt, adding that the three refugee centres in Nieheim are already full. Ms Halbey’s eviction hit the headlines in Germany after she wrote about her situation in a Facebook post which has been shared more than 200,000 times. It is not yet known if the local council has a legal right to evict Ms Halbey as private tenants are strongly protected within German law and can only be evicted if they break their contract. This follows a damning report on conditions in asylum centres across Germany, as the country struggles to cope with the migration crisis in Europe. The letter, written on August 18, stated: ‘It is a fact that women and children are unprotected. This situation is opportune to those men who already regard women as their inferior and treat unaccompanied women as “fair game”. a comment from a Mail reader. Looks like all these young male “refugees” are missing are the uniforms to really make them into the army they are forming across Europe. Welcomed with little or no push-back from those they are coming to take from. Anyone see a problem here?? ?